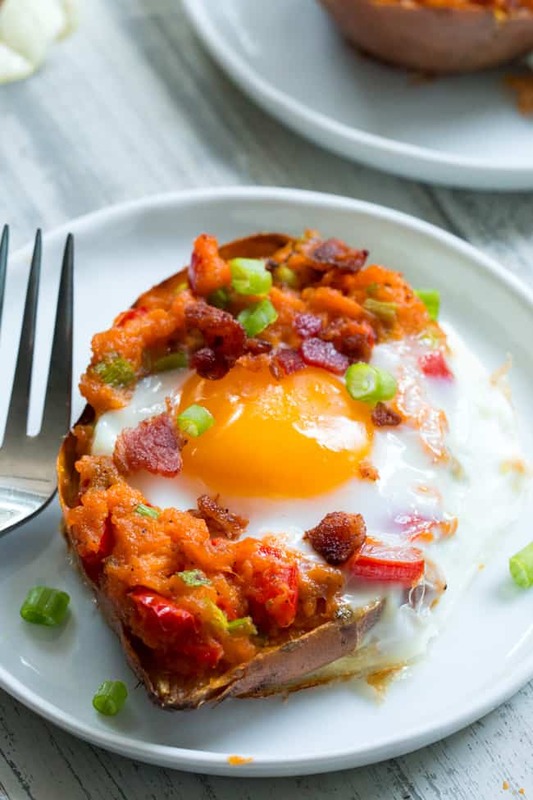 Since twice baked sweet potatoes are one of my favorite meals, I just had to create this breakfast version and it does not disappoint! 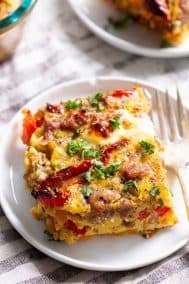 They’re loaded with bacon, onions, and peppers, then baked to perfection with eggs! 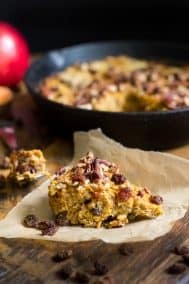 Whole30 compliant and easy to prep ahead of time. 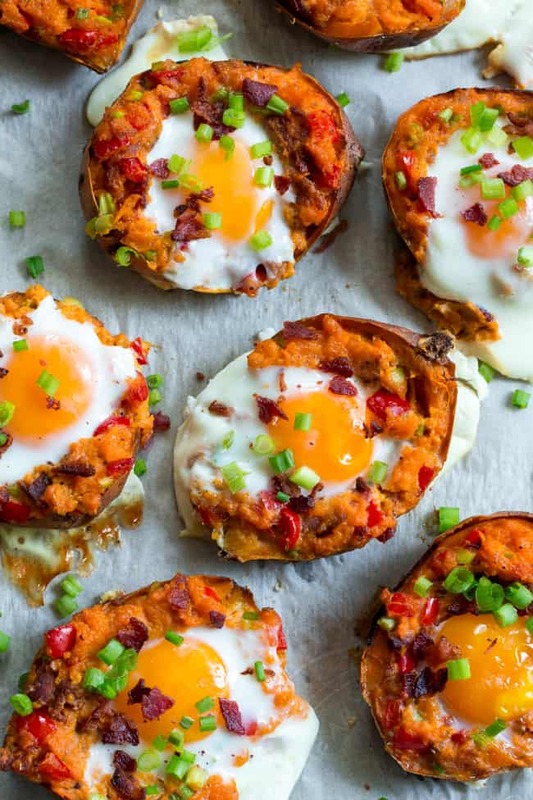 Breakfasts involving sweet potatoes, bacon, and eggs have been my jam since I started paleo. Funny, since prior to paleo I had literally never eaten an egg that wasn’t scrambled or hardboiled, never ate sweet potatoes outside of Thanksgiving, and considered bacon way too fatty to digest. Nowadays, my breakfast is almost always a hash with sweet potatoes (sometimes plantains) bacon or sausage, greens, and an egg. For sure, this is a breakfast I LOVE, but, there are definitely times the idea of a “hash” just isn’t as exciting as it used to be. 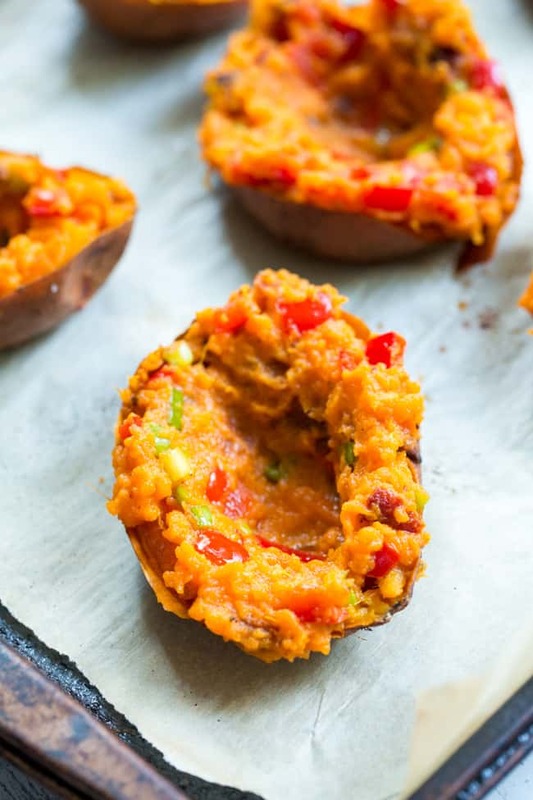 Enter these twice baked sweet potatoes – they’re all the same things I love, just reworked in a different form! And trust me, they’re easier than you might imagine, especially if you do most of the prep work ahead of time. Basically, since none of us are waking up 2 hours early to make breakfast, you can do nearly everything the night before, or on a Sunday with the rest of your meal prep, and then just bake the eggs in the potatoes right before serving. 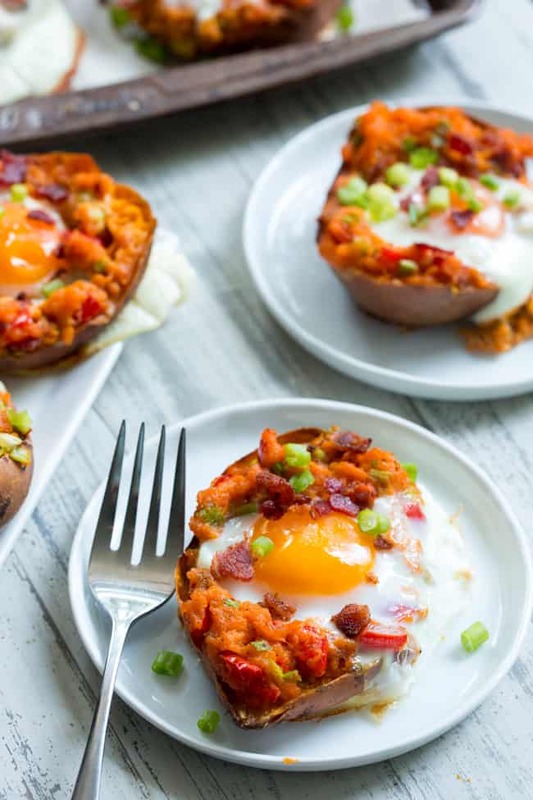 I wanted the filling for these twice baked sweet potatoes to be simple yet really tasty, so I went with the basics – crispy bacon, bell pepper, and onions, plus spices for flavor. 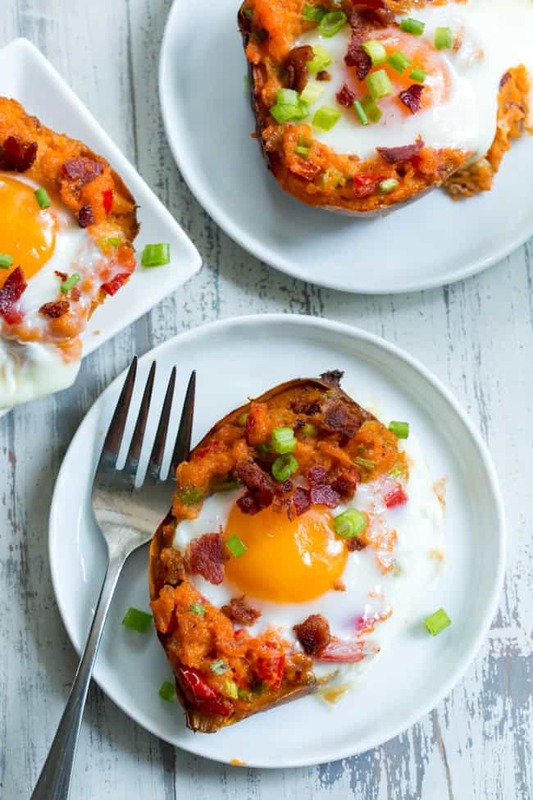 Either scallions or chives are perfect to serve with basically any egg dish, and these twice baked sweet potatoes are no exception. Sneaking a little bit of my favorite breakfast seasoning from Primal Palate in there is not a bad idea either! 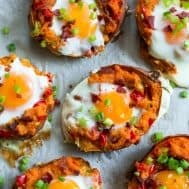 I recommend using sweet potatoes that are on the larger side or this recipe, since you’ll be cutting them in half and cracking an egg into each half. With medium/large ones, you’ll make 8 servings from 4 sweet potatoes. That said, a little bit of overflow is totally fine, just make sure to line your baking sheet with parchment paper for this one! Every time I make twice baked potatoes, I wind up wanting to eat them for every meal – seriously. There’s just something about a good stuffed sweet potato that gets me every time! The perfect sweet/savory blend, with a creamy texture on the inside and crispy skin outside. And yes, I do eat the skin. Once of my favorite parts! I cannot imagine a world where I let a crispy potato skin go to waste! A note on the eggs – while I LOVE a good oven baked egg, the texture is not for everyone. If you prefer (or if you’re feeding picky kids like I have to!) you can scramble some eggs in a skillet (or cook them to preference) and then top the filling AFTER baking for the second time. Just an option for those of you who just can’t do those baked eggs! Now, I think we’re ready to prep these tasty sweet potatoes! Happy (twice) baking and even happier breakfast-ing to all of you! Preheat your oven to 400 degrees F and line a baking sheet with aluminum foil or parchment paper. Scrub your potatoes and coat them in coconut oil or ghee with your hands, then sprinkle sea salt all around. Poke each with a fork a few times to release steam. While potatoes bake, cook the bacon - heat a large, heavy skillet over medium-high heat until crisp; drain on paper towels and set aside. Once bacon is done, reserve a tsp or 2 of the fat to sauté the pepper. Cook peppers over medium high heat, stirring, for just a minute until softened, then remove from heat. Cut each potato in half with a sharp knife. Carefully scoop out the inside of potatoes (using a spoon) in a mixing bowl, leaving a thin layer around the skins. Mash, then stir in the ghee or coconut oil and breakfast seasoning until smooth. Crumble in the cooked bacon and stir in the sauteed peppers and sliced scallions, then season with salt and pepper to taste. Carefully crack an egg into center of each potato half, then bake (at 400 degrees) for another 15 minutes until eggs are cooked to preference. Season with salt and pepper and garnish with extra bacon and scallions. Serve immediately and enjoy! *To make ahead of time, you can follow all the steps up until adding the eggs, refrigerate and then bake the eggs in the potatoes when ready to serve. 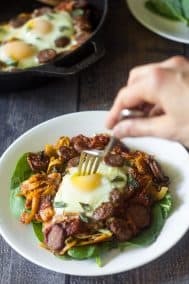 Want More Paleo + Whole30 Breakfast Recipes? Try One of These! I have the same questions as Amber. 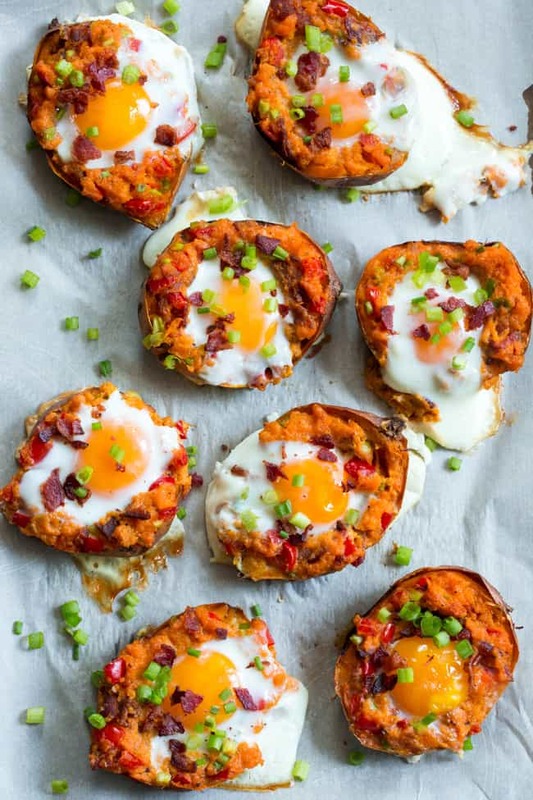 I would love to make these as a meal prep for my friend and me but am unsure about how to handle the eggs. I have 15 minutes in the morning to bake mine (I also don’t even have a microwave) but I know that she is usually very rushed in the morning. Do you think I could do the second bake without the egg and have her just crack the egg in an microwave for 30 seconds and then at 15 second increments after that?